The Eton Executive Satellit adds elegance and utility to sophisticated listening. This new version continues to provide full reception of longwave, medium wave [AM band], shortwave and FM broadcast. 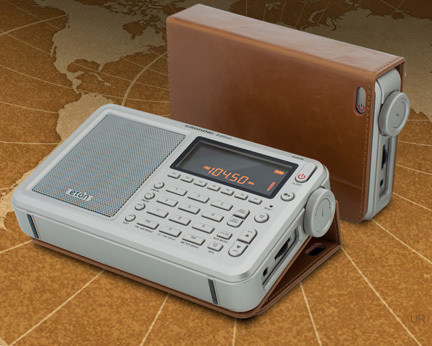 The luxurious wrap-around case protects the radio when traveling and serves as a stand. FM stereo is supported to the 3.5mm earphone jack. Single sideband reception is very good for a portable and may be set to LSB or USB. Additionally, it covers the civil VHF aeronautical band. It also functions as a clock radio. 700 alphanumeric (8 character) memories store your favorite stations in seven banks of 100. You can also simply key in the frequency on the keypad. The medium wave step may be set for 9 or 10 kHz. The FM band may be set to start at 64, 76, 87 or 87.5 MHz. The Local/DX switch controls the sensitivity of the radio. There is a built-in clock which is automatically updated by the radio's RDS function (this function can be turned off, if you wish to manually program in another time zone). Reception of shortwave signals may be enhanced in some circumstance by engaging the Synchronous Tuning circuit. This feature improves the radios sound quality by reducing distortion and fading. There is a 1/8" (3.5mm) external antenna jack. Operation is from four AA batteries (not included). If NiMH AAs are used, you can recharge the batteries inside the radio with the supplied AC adapter. A carry pouch is included. To conserve battery life, the display will darken after 5 seconds. Touch any key to re-illuminate. Only 6.6 x 4.1 x 1.2 inches.